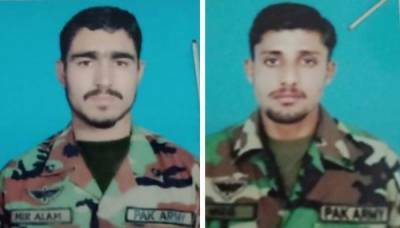 Rawalpindi (Staff Report/Agencies): Two soldiers of Pakistan Army embraced martyrdom and two others were injured during an operation against terrorists in Mangochar area of Kalat on Wednesday night. According to Inter-Services Public Relations (ISPR), an intelligence-based operation (IBO) was carried out “against [a] group of terrorists hiding in the Mangochar area of Kalat”. The terrorists were planning to conduct major terrorist activities in Balochistan in the coming days, however, their nefarious designs have been foiled by the forces under Operation Radd-ul-Fasaad. The martyred soldiers were identified as Sepoys Muhammad Waris and Mir Alam. Both have left behind their widows and children. During the operation, four terrorists were also killed, besides recovering two suicide jackets, a large number of explosives, as well as weapons and ammunition.